Zhengzhou CamelWay Machinery manufacture produces tower cranes, construction elevators, concrete mixing stations, JS concrete mixers, concrete batching machines, stabilized soil mixing stations, wheel loaders, concrete transport tanks, JZC concrete mixers and other construction machinery. The company has an extensive user base in the country, enjoying a high popularity. Some products are exported to Vietnam, Laos, Kazakhstan, Mongolia, Russia, Cuba, Brazil and other countries, being highly praised by foreign friends. On the other aspect, the mixing blades of twin horizontal shaft concrete mixer rotate reversely. The blades mix materials repeatedly to make the materials more homogeneous. In this fierce process of rotation, it saved much more time. Therefore, the twin shaft concrete mixer is featured by high efficiency and low time-consuming. 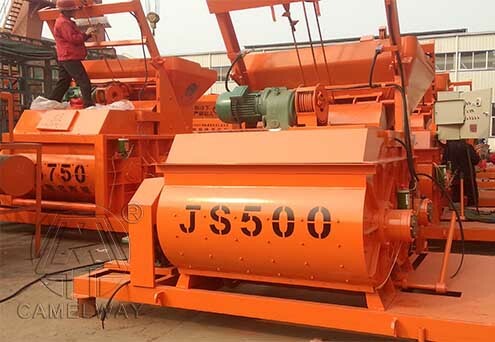 This concrete mixer is widely used in the whole world for it is more cost effective. For more information about any of our products, please feel free to contact Zhengzhou CamelWay Machinery via email or at the contact addresses available on this website. This entry was posted in Solution and tagged mixer by camelway. Bookmark the permalink.